Perfect for my need. The only problem was the pull out table needs to be secured with wood glue. 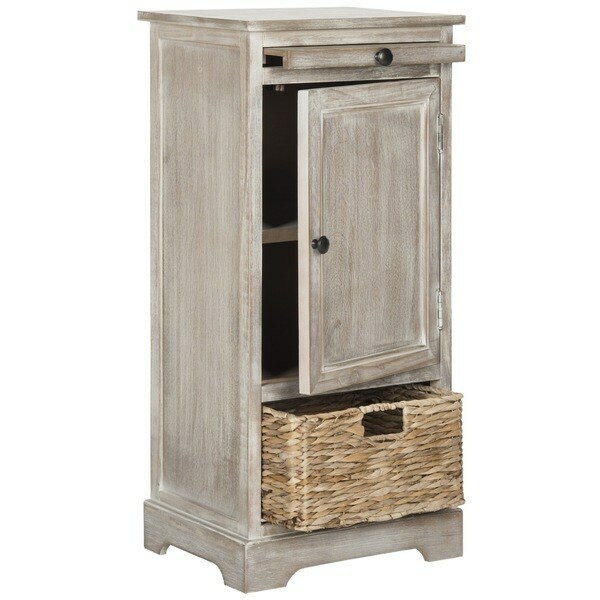 Relaxed and casual, the Raven storage unit in pine with winter melody finish has an easygoing appeal that's perfect for a country casual style. With a roomy cabinet and one pull out woven rattan basket with cutout handle, Raven makes stashing remotes, CDs and magazines a breeze. The door sticks a bit on this so you have to hold the cabinet still while you open it. Be aware that the bottom is open—there is only a slat on each side supporting the basket. This makes pulling the basket out/pushing it back in a little annoying. I think it looks sort of cheaply made but the convenience of zero assembly was so enticing that I couldn’t pass it up. I painted and distressed it using chalk paint, and added it to my kids’ bathroom that I have remodeled. I much prefer the unique look of it now. 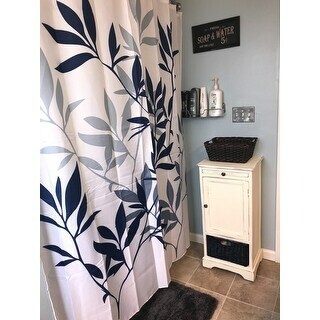 I purchased the Safavieh Raven Winter Melody Tall Storage Unit because I needed a specific size, Storage solution to hold all of my bathroom necessities. It is the perfect size for the space I have and the color is as pictured, the overall quality is nice and I like that it has the option of the pull out shelf, the cabinet is roomy as well as study however there is not a shelf underneath the basket on the bottom, once the basket is removed you will see your floor, which is why I gave it 4 stars. I would've liked to have the option of removing the basket and utilizing that space as a shelf. This item is great! Came quickly and was packaged very well. Provides wonderful extra storage in my compact space. It has a nice variety of textures with the wood and rattan combination. The finish is an aged washed gray which blends beautifully into my casual vintage farmhouse look. I used it in my living room to store my DVD player and dvds but also would be a perfect cabinet in a bathroom for towels or products. A great piece for the price! I purchased this for my brother and it does come assembled. I love the storage and its pull out shelf. The wicker basket below is good quality and not one of those that look like it will fall apart. It is more on the grey side if that is the color you are looking for. I love Safavieh merchandise. I have order many Safavieh from Overstock and never disappointed. This was the great addition to our living room. Perfect storage cabinet. Color is a really nice gray. The basket is perfect for storing remotes and books. I purchased two of these grey tall storage units. They are really pretty. They are taller than I imagined and work well for my high bed. I recommend them. I was all set to give this cabinet 5 stars...it shipped within 12 hours of my order so I was immediately impressed. It's a pretty cabinet and it's definitely gray unlike the picture on the website, which makes it look tan. Sadly, they sent me a damaged cabinet. I thought after all the reviews from people mentioning damage to their cabinet, Safavieh would have rectified the problems, but they didn't. It isn't a huge amount of damage, but it's so obvious to me. There's a crack on the top right corner of the cabinet. It looks like the corner broke off and they glued it back on and refinished it. The corner of the cabinet slopes towards the ground and the crack is obvious. This should have never made it out of the factory. I realize this is a "rustic" finish but this is out and out damage. So now I have to decide...go through the hassle of returning this cabinet for another or live with the damage. Buying something new should be fun, but this is just annoying. Safavieh, you need to revamp your quality assurance department. They aren't cutting it. It looks cute in person--the deliberately weathered look, if that fits your room. It matched my daughter's other furniture. However, as soon as I opened the top extension piece, the piece broke off in my hand. Very cheaply made. As others have said, the space under the basket is wide open, and the basket does not slide out easily, both these these things are awkward. The door opens stiffly also. So the functionality is low. But, it does offer a surface to go next to my daughter's very tall bed. She likes that she has a place now to put her ipad! And I like that it looks cute. If you want a functioning piece though, with doors that easily open etc, don't get this. Beautiful, just like the picture. Comes fully assembled. Out of the box and straight to it's place. Received compliments on it immediately. I love the color and the wicker basket, love it entirely. Just perfect for our half bath. Nice quality and storage. Two shelves are deep enough to hold a lot, I have a printer on top which was perfect. Even though the bottom is just a basket it is pretty sturdy. I love it! It was just the right size for what I needed. Sturdy construction - I only had to add the knob to the cutting board! Came with a broken pull out shelf so I returned it. The color was ok.
Nice item and not a big price tag. Fits in nicely in any room. Perfect addition to my kitchen! Very nice looking accent piece. But also, very light weight, composite feel to the wood. Gets a job done. Not an heirloom. It’s perfect for my needs. The basket is a bit “rough”. Also wobbled a little but made it stable using felt pads. All told I am very pleased. I would recommend but look at the dimensions. I did not and it is shorter then I thought it was going to be, but it works for me. I was some what disappointed with the color. It appears more gray which I really wanted , but again will work out. It's perfect and exactly what I was looking for. Looks just like the picture. If you are looking for something to go with your rustic decor this is a great piece. Provides a lot of storage and it looks really nice no matter what room you would display it in. I've gotten a lot of compliments and I'm not disappointed on my decision to buy this. Prefect fit and looks great in bedroom loft. Arrived quickly. Packed well but there are scratches on the door. This unit is not well made. It’s wobbly so I had to put a piece of cardboard under one leg. The pull out shelve is also wobbly and again I had to place a piece of cardboard to make sturdy enough to use. It looks great but poor quality. ""will bath towels fit on the shelves?"" The inside shelves are 13 inches x 11.4 inches x 9 inches. "Would the inside shelves fit liquor bottles? Are they adjustable?" It won't fit the tall liquor bottles. No, you can't adjust the shelf. "Can you choose which way the cabinet door opens/is the door reversible?" It isn't made to be changed but if you're a woodworker you may be able to do it. There are no pre-drilled holes that enable you to switch the door around easily. "Is the pull out shelf at the top of this unit sturdy and is it large enough to set books on?" "What are the measurements in the dimensions"
"It says it's distressed gray but it looks a brownish gray - or warm gray vs. a cool gray. Which is it?" It's a distressed gray. Not brown. It's kind of a warm gray. I love it! Warm gray distressed. Very pleasing color. The finish is vintage white. "What is the weight capacity for each comartment?" Not exactly sure what compartment you're asking about weight. It's solid wood. Very durable.